A Dutch consortium of coastal engineering concerns, NGOs and maritime knowledge institutes (Witteveen+Bos, Deltares, EcoShape, Wetlands International, Wageningen University and IMARES) together with the Indonesian government and Indonesian partners have recently developed an innovative approach to mangrove restoration near the city of Semarang, northern Java island. The simple technique employed actually comes from ancient wisdom. Medieval monks of Netherlands have built rickety dams to grow habitable land in parts of the Dutch delta by creating slow growing salt marshes. Following this trick, here semi-permeable dams are built from bamboo poles packed with branches. These semi-porous dams allow water to stream back through it while catching sediments that the waves carry from the sea. 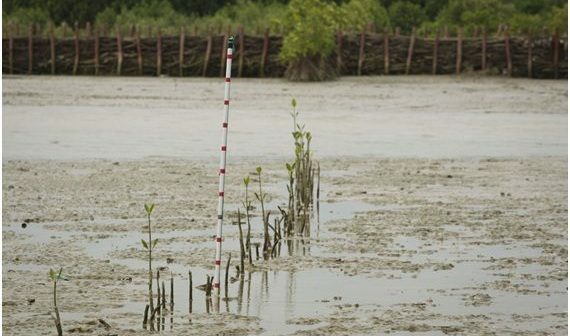 This provides a nutritional base for mangrove seeds to recruit and recover by themselves, unlike traditional mangrove restoration efforts where people have to plant out cuttings and seedlings. This method is predicted to be more successful than the traditional, as it facilitates natural succession of mangrove forests. Like in many other parts of the world mangrove forests in Java have been damaged or destroyed due to agriculture and aquaculture for ever-expanding cities. 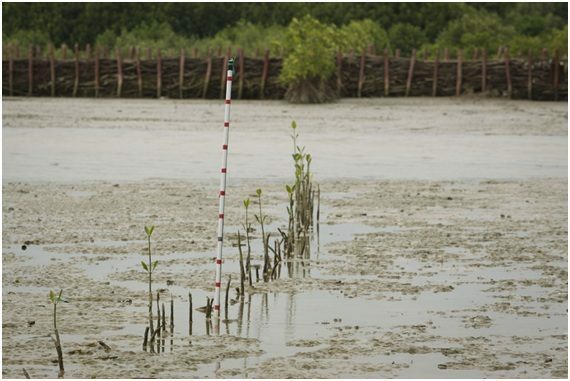 Canalization of inland rivers have resulted in reduced nutrient base for mangroves. In the absence of these natural coastal defences, rising sea levels and storms are taking their toll. On Java, coast has sometimes been eroded up to several kilometres inland and estimated 30 million people are in danger according to Wetlands International. This dam building project is based on the concept “building with nature” developed in the Netherlands for enlisting the help of nature in defending coasts against the sea. They have successfully utilized this concept for several projects around the world from Netherlands to Bangladesh, Surinam and Vietnam. The project is a community based one, which the dams are woven by local people and many other initiatives to promote sustainable aquaculture and fisheries are incorporated.